The Expositor’s Kit provides seven trustworthy resources to help equip you to faithfully preach and proclaim the truths of Scripture. 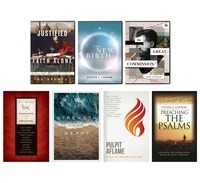 These books and video teaching series have been handpicked by Dr. Steven Lawson, founder of OnePassion Ministries and a Ligonier teaching fellow. Dr. Lawson has spent more than forty-five years in preaching and teaching ministry and now trains the next generation of pastors through The Institute for Expository Preaching. Order your bundle of resources valued at over $200 and get historical and practical wisdom on the exposition of God’s Word. Don’t forget, you can also receive hands-on training from Dr. Lawson at The Institute for Expository Preaching. We invite pastors, Bible teachers, and church leaders to sign up for a seminar in a city near you.